Business groups in Ireland, Northern Ireland and the UK have joined forces to call on both sides of the Brexit debate to redouble efforts in their on-going negotiations to reach a deal. Chambers Ireland, the British Chambers of Commerce and the Northern Ireland Chamber of Commerce and Industry are meeting in Dublin today. The three groups want to see the Brexit talks reach an agreement that provides clarity and continuity for trade within and between these islands. They said they want to avoid a messy or disorderly Brexit, which would be hugely disruptive to trading firms and key transport links in all three jurisdictions. Ian Talbot, CEO of Chambers Ireland, said the relationship between the three organisations has never been stronger. He said this relationship will be of great benefit as they navigate "this extraordinarily turbulent period and forge a new trading relationship". Mr Talbot said that politicians must accept that businesses can not operate on the basis of 'snap' decisions but instead require realistic timeframes, so they can establish project plans, and allocate appropriate resources. "Not having enough time to do so will inevitably result in unnecessary upheaval and economic pain," he stated. "Clarity on the implications of Brexit is immediately required. We therefore call on all parties to the negotiations to ensure that common sense solutions are agreed that provide stability to minimise the impact on businesses and their employees. Mature acceptance of harsh realities is long overdue," he added. Dr Adam Marshall, Director General of the British Chambers of Commerce, said politicians on all sides need to focus their attention and energies on getting an agreement over the line within the next two months. "Businesses across the UK and Ireland have been patiently awaiting answers to the many questions which Brexit poses about future trading conditions, but time is running out and they need clarity. The flow of trade across the island of Ireland, and between Northern Ireland and the Republic and Great Britain, is the lifeblood of many trading firms. "Practical solutions must be found to support and maintain these vital economic and trade links," he added. Ann McGregor, chief executive of Northern Ireland Chamber of Commerce and Industry, said that being able to trade as freely as possible with limited bureaucracy, along with the free movement of people, is vitally important for Northern Ireland's economy. "The build up to the UK leaving the EU has been having a largely negative impact on Northern Ireland businesses in terms of costs, sales, non-national jobs and investment plans in particular," Ms McGregor said. "It is vital that politicians on all sides get an agreement over the line as soon as possible to provide businesses with the much needed certainty that is required for them to plan ahead," she added. 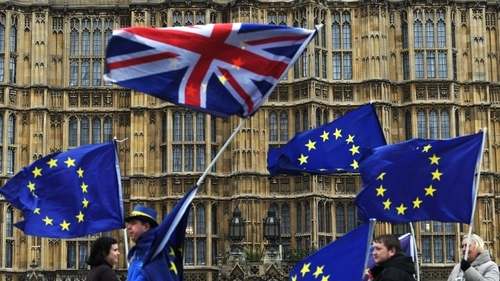 Meanwhile, a new survey by the British Chambers of Commerce has found that companies in Northern Ireland would be particularly exposed to the ramifications of a no-deal Brexit scenario. The survey reveals that 41% of companies in the North said they would have to respond by moving some or all of their business to the EU, while 32% would revise their investment plans and 29% would change their recruitment plans. It also shows that almost a fifth of businesses in Northern Ireland have already noticed a decrease in the value of EU contracts (18%) and in the number of EU workers (17%) in the last year.